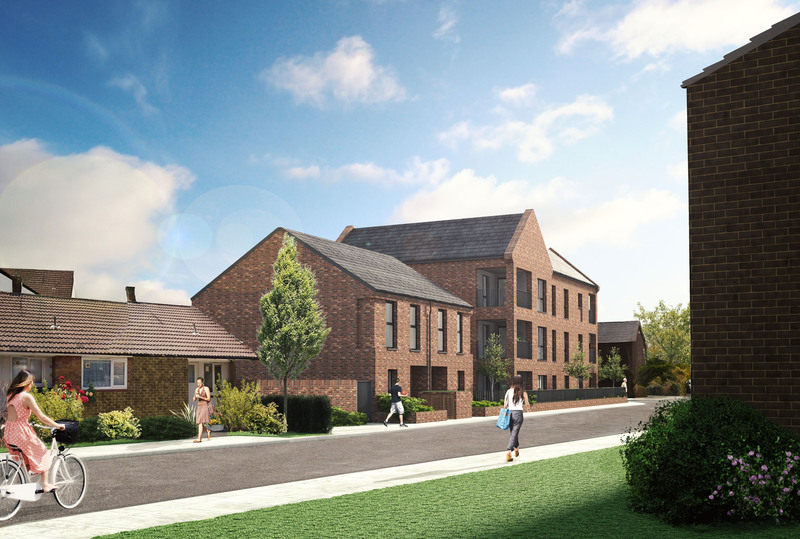 The development comprises the demolition of the existing garages and erection of a 3-storey flat block comprising 11 flats fronting onto Elmshurst Crescent, and two 2-bed houses fronting onto Pulham Avenue. All units will meet or exceed London Plan internal Standards and all will fall within the affordable rent tenure. 1 of the ground floor units in the block will be wheelchair accessible, designed to Building Regulations Part M4(3). The architectural style and construction in brick will complement that of the neighbouring three-storey buildings on the estate and the bungalows to the east. Reorganisation of the parking allows for the provision of a larger area of amenity space that will form part of the central amenity space. A total of 31 car parking spaces would be provided on site along with the re-landscaping of existing and proposed amenity areas. 13 spaces for the new dwelling plus additional spaces to better organise parking on the estate and help ease parking stress issues. The five trees on site will need to be removed however a larger number of trees would be planted as part of the re-landscaping of the site. There is provision for 28 cycle storage spaces within the cycle store at ground floor level within the flat block.